Cute idea for Junior Chef! Do you think your kids want to get interested in really cooking with you? That would be so cool! I've seen very young kids that can stir and break eggs like a pro. It's amazing! great that your kids are interested in cooking, so they will cook some lovely home dishes for themselves and family when they are grown ups. ya.. i was thinking how do you make the hearshape egg yolk too? do you cooked egg yolk and egg white seperately? Think you will expect most of us will ask you how to make it right? haha..
hi there, this is my very first comment, i`ve been put your blog link in my blog long time ago. then i stopped it, i guess must try again & again, rite? Looks beautiful and delicious! I LOVE the heart shaped yolk in the egg!!! Wow! How did you get the egg yolk in a heart shape? Ok wait, I just read everyone's comments. I think we all have the same question. lol. So cute! K likes to help out in the kitchen but only to make a mess and then leaves when she feels she's done. We are her personal servants. haha! Cute cute bentos! HI Lia Chen, Your bento is really lovely! Since I'm new, I was wondering if the kids going for morning school, whether the rice is from yesterday's nite or it's freshly cooked? Cos cooking rice also need some time so I dont know whether it's enough time or not as I've to rush to work as well. 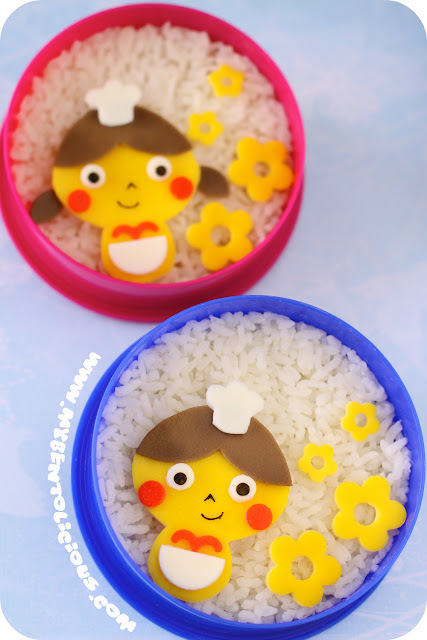 I think your girl can help you prepare bento soon! @Jun : Thanks a lot Jun! 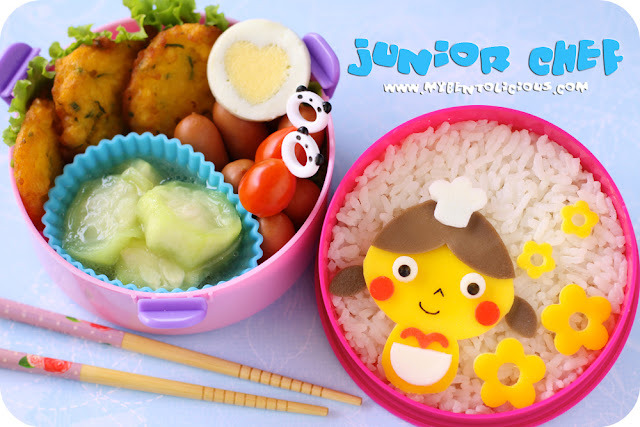 I love your Bentos, all of them are decorated with Love! I love watching cooking shows too, even though my all-time favourite is still 'Iron Chef'...;)! !